On top of not being totally confident whether you should pronounce the first “r” or not, there’s a lot to unpack when it comes to the anti-inflammatory spice-turned-supplement that is turmeric—like, what it actually does for your body and how, exactly, to use it. 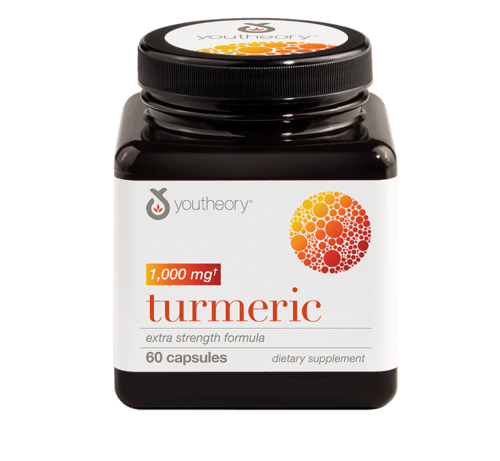 Despite Instagrammers everywhere dousing their veggies in turmeric, whisking it into lattes, and blending it into smoothies, Nick Bitz, ND, chief scientific officer at Youtheory®, says there are actually a couple reasons you should opt for supplements over food for your turmeric intake. “The first reason deals with potency,” Dr. Bitz explains. “The type of turmeric used in culinary dishes is about four percent curcuminoids, whereas the type of turmeric used in most supplements is 95 percent curcuminoids.” If you’re scratching your head wondering what the heck a curcuminoid is, FYI they’re the active compounds in turmeric that give it all its health benefits (and golden color). The second reason deals with absorption. “When consumed in food, turmeric is rapidly broken down and only very little reaches the bloodstream,” he says. 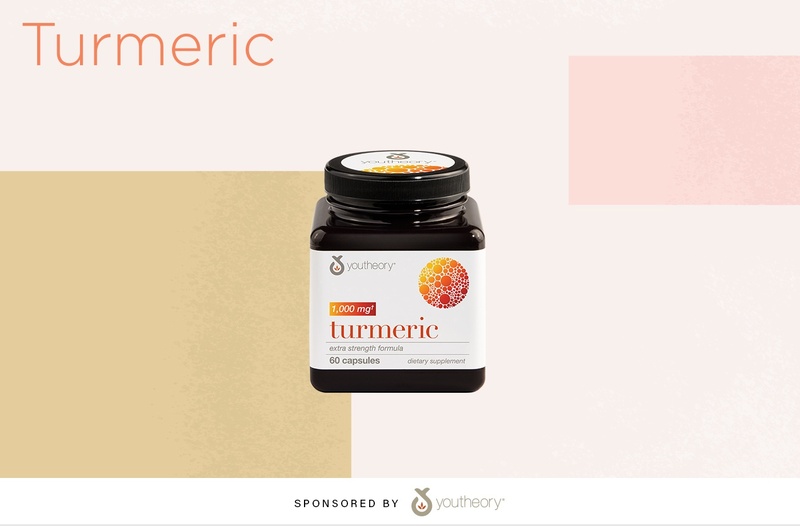 To make sure you’re getting the most bang for your buck when it comes to potency and absorption, Dr. Bitz recommends taking supplements, like the Youtheory® Turmeric Extra Strength Formula, because the combo of a super concentrated turmeric extract plus black pepper has the potential to help boost blood levels of curcuminoids by 2,000 percent. In short, you’d have to eat a lot of turmeric to get that kind of benefit via food. Bad news for your golden latte habit. Great news for not staining all your mugs yellow. Keep reading to learn more about the turmeric benefits you’re going to want in on. Turmeric has been around basically forever—its use dates back to nearly 4,000 years ago—but only recently has it earned the badge of superfood. Dr. Bitz attributes turmeric’s rise in popularity to the palpable benefits of curcuminoids, which have been linked to improvements in inflammation, joint health, skin health, brain health, liver health, immunity, microbiome, and more. 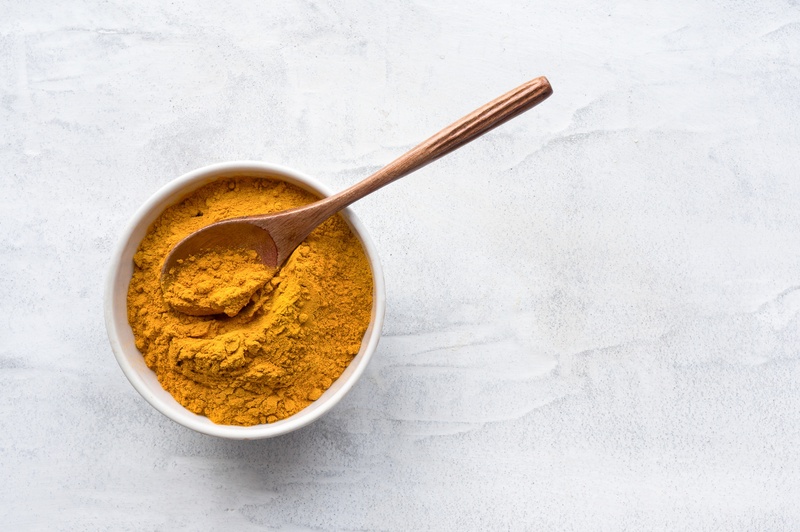 “I think people are initially drawn to the hype and mystique surrounding turmeric, but become devoted users when they experience firsthand how powerful these concentrated extracts can be,” says Dr. Bitz. So, what very well may have started out as an Instagram craze has turned into a full-blown obsession with the ancient powers it possesses. You might be wondering: What exactly are these life-changing #blessings that turn wellness skeptics into daily turmeric-poppers? Well, there are three main benefits, according to Dr. Bitz. The first is that it targets the master regulator of inflammation in the body, called NF Kappa B. Sounds like a sorority, but it’s really a key component in limiting the effects of inflammation in the body. PSA: Scientists believe that low-level inflammation is one of the most disruptive forces in the body, according to Dr. Bitz, so limiting it is def good thing. Second is that turmeric increases the antioxidant capacity of the body. “Curcuminoid […] can help neutralize free radicals and also work to stimulate the body’s own antioxidant enzymes,” says Dr. Bitz. And third, turmeric is traditionally used to support your liver health. “In Japan, turmeric is prized for its positive effects on the liver and is widely used for hangovers. New and emerging research is beginning to validate turmeric’s potential in this area,” he says. Three cheers for having a few cold ones, and still feeling like your healthiest self the next day. You really don’t need to take turmeric for long to start experiencing the benefits. “I find that a one-time dose before or after exercise can help minimize the symptoms of overexertion,” he says. But, you’ll obviously feel stronger effects if you continue to take it regularly. Says Dr. Bitz, “When you use turmeric as an everyday supplement, it can transform your inner physiology so that you express inflammation in a more optimal or healthy manner.” He suggests taking about a gram a day, but it’s safe to consume in large doses—even up to 12 grams a day if that’s your thing. “Turmeric is nothing short of nutritional gold,” Dr. Bitz says. “It’s quickly proving itself to be one of the most important botanicals that we have at our disposal for promoting whole body health.” How’s that for some gold-star praise?